Some plants can be so fragile and need a lot of specialist care, and can put off beginner gardeners. That's certainly not the case with the Carex EverColor® Series. Plants are evergreen, 'tough as old boots' and require very little maintenance; just a comb through once a year! Could this be the ultimate football-proof plant? Carex are a typically popular landscape plant, chosen for their resilience. 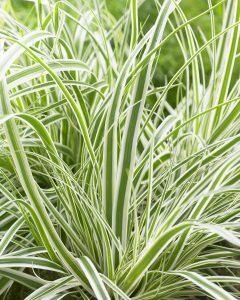 But, of course, Carex EverColor® Everest is a special selection, with silver-lined foliage and an arching frame. How was this plant created? Irish grower Pat Fitzgerald started growing Carex in 1989, and has since established a full portfolio of varieties by breeding Carex oshimensis. They continue to breed new strains for the future. Carex EverColor® Everest is a standout tough grass, selected from hundreds of contenders. The qualities this ornamental grass boasts include zero maintenance, soil flexibility and -20C hardiness! You'll find it hard to kill it, I reckon! What’s different about this plant? You're looking at a plant with a multitude of uses, in fact you may even be able to suggest a few more! Rockeries, mixed patio containers, edging, roof gardens, planting into gaps in walls, hanging baskets, the list goes on.. The BIG difference has to be it's impressive ZERO maintenance requirements. Well, not quite zero, you have to comb out the browned foliage once a year. Ah, but that'll be fun anyways, like caring for a barbie doll! 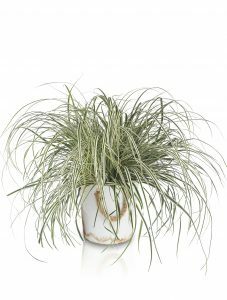 Where can you plant Carex EverColor® Everest? Plant your tough grass into sun, part shade or full shade! All this plant needs is a good, well-drained soil. Plants will grow to around 50cm (20") tall, and about the same across. 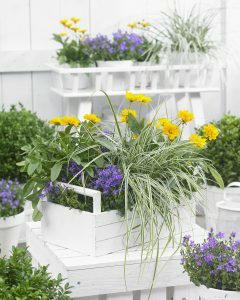 Paint your garden with colour through every season with this amazing plant! Hardy: Survives down to -20C! Plant will come back every year. Plant of the Month is sponsored by Plantipp, a company based in The Netherlands who handle the introduction of new plants into Europe. Carex EverColor® Everest was selected by Pat Fitzgerald at Fitzgerald Nursery. It can actually be quite easy to spot new plants, as nature often does the breeding work for you! Natural variation is referred to as a ‘sport’, or you may find a new hybrid has appeared in your garden by itself. To hunt down these new plants, it’s all about noticing differences. Make sure you take time out to get to know the plants in your garden, and if any seem different to the norm, let me know!